OnePlus Cardboard at less than $2! We talked about OnePlus innovating product launches with their OnePlus Two launch, which we’re looking forward to, towards the end of this month; in which we had mentioned about the OnePlus Cardboard, OnePlus’ venture to support VR take flight ASAP. In an official blog post yesterday, OnePlus announced the release of the OnePlus CardBoard available for those in India at a price of less than $2! 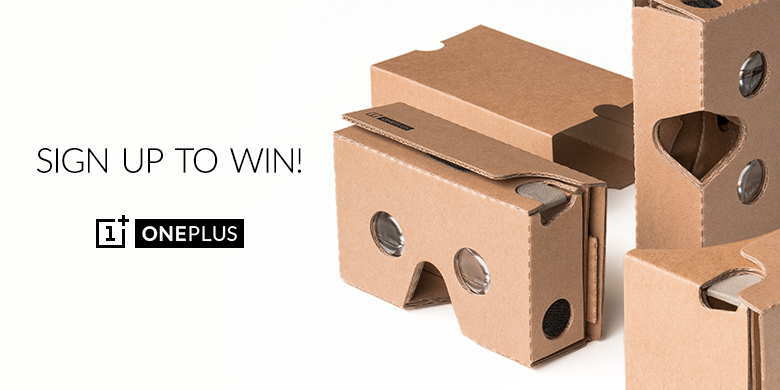 They also announced the OnePlus Cardboard giveaway which closes tomorrow, so hurry! Having spoken before about VR (virtual reality) holding a lot of potential, and the people at OnePlus being excited to drive forward the idea; and the subtle, and honest announcement of it releasing the OnePlus CardBoard, a venture in which it’ll lose money with every unit they sell; OnePlus who’ll be unveiling their latest flagship device, the OnePlus 2, completely in VR; want no loose ends at it! Though we might say they have vested interests to get everyone to watch their product launch, they also said that they seek to bring across an immersive VR adventure in a fun and affordable way. Meeting the latest specs for Cardboard 2.0 unveiled at Google I/O this year, and being a typical OnePlus custom, they didn’t just sit around and talk about how to make it better, but actually did! Well, what else would you expect from a startup which raised quite a few eyebrows with their original OnePlus One flagship release, a phone which is still in demand. Having a stronger, thicker material for the cardboard and added high-quality velcro for maximum durability, OnePlus seeks to make the Cardboard a durable entity, opposed to other makers seeking to make them to be easily disposible. Without compromising on functionality, and the amazing visual experience, the package is 20% smaller, yet perfectly holding the OnePlus One, and designed to easily be compatible with most devices up to 6″ in size. Being coated with a special film that repels dirt and oils, the OnePlus Cardboard gives a premium feel. You can avoid the dreaded “forehead stain.” You’ve never seen cardboard quite like this. With a Cardboard, you can explore a variety of applications that are designed for providing you the VR Experience! Visit new places, play immersive games, fly through space and much more with the variety of apps available on the Google Store. A 1000 lucky people will be chosen at random and will be shipped OnePlus Cardboards for free with the shipping on house! Simply fill up this form here, and hurry! The contest closes on July 3. The contest winners will be contacted by OnePlus after the draw. The OnePlus Cardboards will go on sale from the third week of July at a super price of Rs. 99 (shipping as per Amazon India policy). The exact sale date on the platform will be communicated via Social Media by OnePlus soon. So, a Cardboard device shipping at less than $2 could potentially be a game changer like the Raspberry Pi, a potential full fledged computer that costs less than $35. Whad’dya think? Let us know in the comments below!